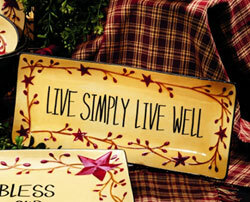 Dishes & Tableware in country and farmhouse style themes, by Certified International, DII, Park Designs, and more! Apple Jack Dinnerware, by Park Designs. 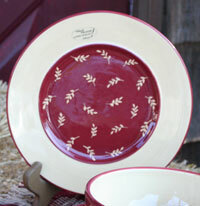 This fabulous new dinnerware features a cranberry red and light toffee cream color scheme, with a pattern of tiny leaves. Accessories nod to the apple theme, such apple basket salt and pepper shakers, and apple icon on the pitcher. 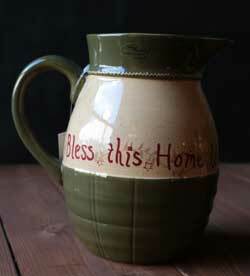 Perfect for that classy country kitchen look! This is for the SALAD PLATE - measures 8.5 inches in diameter. Other dinnerware items, linens, and accessories available! 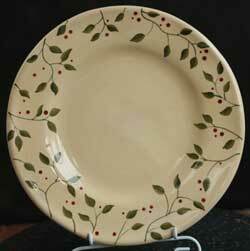 Berry Vine Salad Plate, by Park Designs. The Berry Vine ceramic collection features a hand-painted leafy vine pattern in sage green with burgundy berries against an ecru background. Available in both the vine only or with the homey phrase: Live, Laugh, Love. This is for the Salad Plate with just the vine rim (no writing). Measures 9 inches in diameter. Microwave (for reheating) and dishwasher safe. Coordinates beautifully with the Casual Classics Dinnerware in Leaf or Persimmon to make complete place settings. Matching linens and coordinating dinnerware available! Park has discontinued this collection - quantities are limited! Family Table Dinnerware, by Certified International. 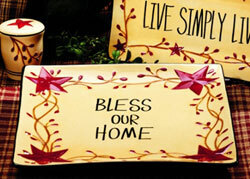 Featuring the whimsical artwork of Dan DiPaolo in homey, family inspired images, in a warm color scheme of black, cream, barn red, and touches of golden yellow. 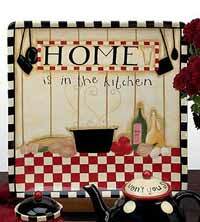 This is for the Square Platter, which reads: Home is in the kitchen! Measures 12.5 inches. 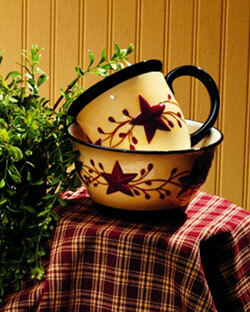 Redware Star Pottery, by K & K Interiors. 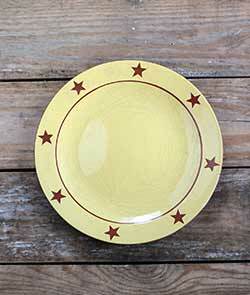 Antique mustard stoneware with red stars and a fine crackle in the glaze for an aged appearance. This is for the DESSERT PLATE (or bread & butter plate). Measures 7.5 inches in diameter. Microwave safe, but not oven or dishwasher. This is a really neat primitive looking collection, fabulous displayed in antique hutches or cabinets! 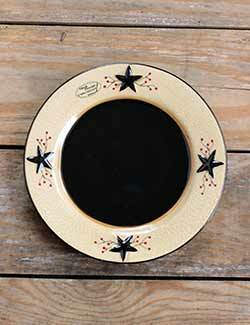 Antique mustard stoneware with red stars and a fine crackle in the glaze for an aged appearance. This is for the DINNER PLATE. 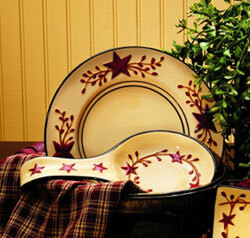 Redware Star Pottery, by K & K Interiors. 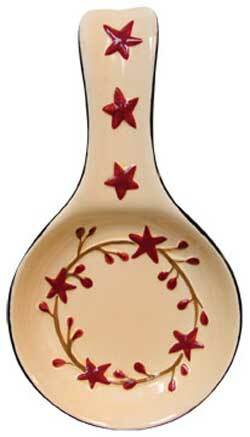 Antique mustard stoneware with red stars and a fine crackle in the glaze for an aged appearance. This is for the RIMMED BOWL (for soup, cereal, or salad). Underside of bowl is the redware red. Measures 9 inches in diameter. Microwave safe, but no oven or dishwasher. This is a really neat primitive looking set, fabulous displayed in antique hutches or cabinets! 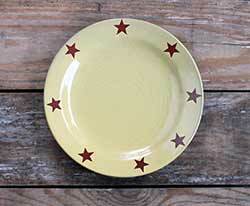 Antique mustard stoneware with red stars and a fine crackle in the glaze for an aged appearance. This is for the SALAD PLATE (or luncheon plate). 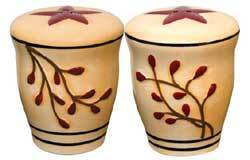 Ceramic pottery in a striking color scheme of black, cream, and red, featuring raised black stars against a toasty cream, slightly textured background, black center, and accents of tiny red berries. 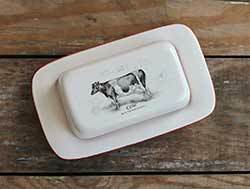 Give a respectful nod to the maker of the beloved stick of butter with this covered dish adorned with a vintage cow image - perfect for that farmhouse country kitchen table!